Writing a higher education cover letter using these expert tips will help you secure an interview and top job offer in a competitive job market. Whether you are applying to become the next Dean of Students, Campus Coordinator, Director of Alumni Relations, College Adjunct Instructor or University Professor, ensure you are the individual getting an interview and that dream job. When reviewing job postings, you will discover the advert could request a cover letter, application letter, letter of intent or letter of introduction. These are just different ways to refer to the letter they expect to see accompany the resume or CV. Implement these tried and true higher education cover letter writing tips to showcase your best value. A well-written cover letter can be just as impressive as a properly designed resume, a cover letter a.k.a. the application letter should always accompany a resume or CV. This is the opportunity to fine-tune your storytelling abilities and speak to the institution specifically by tailoring your accomplishments and personal traits to a particular job. Describe your abilities, competencies, skills, knowledge, and expertise, and illustrate them with concrete, institution-specific, examples. This is the prime time to tell a hiring committee why you are the perfect candidate, the one whose values, expertise, and skills match the mission and needs of the department. Implementing the strategies in this post will help you to make a career transition into a university or college confidently. The more you know about the institution you are applying for, the easier it will be to tailor your higher education cover letter to the specific needs, goals, and mission of the college or university. Whether you are targeting an Executive Director position or applying for an Adjunct Professor posting, being able to directly relate your skills and expertise to the needs of the institution will go a long way when your application is being assessed. Even if some of your research does not come through in your cover letter, this is excellent preparation for the interview that you are setting yourself up for with a professionally written cover letter. You will be better equipped to answer questions such as “Why this job?” and “How are you qualified?” if you have a thorough understanding of what the position requires. Dive into the college or university’s website to find key institutional characteristics, strategic goals, needs, and their educational mission. This is also the place you will discover the institutions “language”. Try to mimic the wording you find in your cover letter to that of the website and job description. This may set you apart from other applicants as you have put in that extra effort to gain a better understanding of what the position entails and how the institution positions itself in the educational world. Just because you may be sending out your resume and cover letter to multiple institutions, do not let the faculties know this by submitting a generic template cover letter. If you have done your due diligence in learning what the position entails, then you should be able to tailor your cover letter to the specific position. The easiest way to do this is to include the college or university name in your letter. Additionally, ensure you address the college’s particular needs with your accomplishments, this will show the hiring committee that not only are you familiar with their goals, but you have the experience to back up your self-marketing. If you take the extra time to tailor your cover letter to the position you are applying for, be it the Dean of Students or Director of Communications, you are increasing your chances of being selected for an interview. When highlighting your capabilities and achievements, it is of utmost importance to illustrate how your competencies will meet the objectives of the position you aim to fill. Whether you list your capabilities in bullet or paragraph form, do it in a concise way so that the hiring committee can see and read how you are the right candidate for the position. When applying for higher education positions such as Chief Technology Officer, Campus Coordinator, or Executive Director, you want to make sure the accomplishments and experiences you add to your cover letter are relevant to the specific position and institution you are targeting. A good rule of thumb is to highlight the job description and any other documents with the general position expectations with keywords that pertain to your own expertise and achievements. This will enable you to specify in your letter what you bring to the table. As you move forward in your career, an idea would be to create a document that lists all your accomplishments as you would word them for a cover letter, in paragraph form, and simply insert them, after cleaning it up a bit, into your cover letters for new employment opportunities. This way you always have the sense of a tailored cover letter, although you may have a copy and pasted the middle section, and don’t have to spend hours creating a brand new letter each time you want to apply somewhere. Whenever possible, take a cue from your resume and quantify your accomplishments. If you have “increased student enrolment by 15%” in your tenure, then say so. Take that achievement, develop it into something the hiring committee can see you taking on in their company, and specify that in your cover letter. These may seem like tedious details, but sometimes it’s the numbers that stand out in a sea of words, so take advantage of the opportunity to market yourself in a way that the competition may not. The job posting should provide you with a wealth of information about the employer and the type of person they want to hire. You want your cover letter to engage the reader so make sure to speak to the responsibilities and job description without repeating it word for word. As well, make sure you are using keywords that are applicable to your career and actually apply to your competencies. Dean of Students: analytical thinking, leadership and managerial competencies, organized, self-motivated, humanitarian, technologically competent, approachable. Adjunct Professor: syllabus creation, student performance monitoring, collaboration and coordination, organizational skills, teamwork, computer competencies. Director of Admissions: application assessment, institution promotion, management abilities, administrative competencies, attention to detail, enrollment assistance. Chief Technology Officer: computer proficiency, technical expertise, leadership, analytical, communication and interpersonal skills, and teamwork. You should format your higher education cover letter so that it can be read easily if sent over email, a PDF is the best as it can be opened and viewed exactly how you created it. This is a good rule of thumb to remember if you intend to attach it to the email or application website. It may be best practice to copy and paste your cover letter into the body of the email to ensure that the hiring manager reads it, they may not open the cover letter as an attachment, and instead, go straight to the resume. A cover letter is your opportunity to be more personal and speak as if you were having a conversation, however, do not make it too lengthy. Ensure you keep your resume to one page in length. This single page encompasses three to four paragraphs that describe your intention, your qualifications and accomplishments, and a closing. Whenever possible, while you are researching information about the position and the institution, make note of who may be reading your application. Some hiring managers may not care that the letter is addressed specifically to them. Why take the chance and leave their name out when it could be important to the person reading your cover letter. If the name is not listed in the job description, contact the Department or Human Resources to find out whom it should be addressed to. The first paragraph of your cover letter should state the position you are applying for, the institution you are applying to, and the reason you are the right candidate for the job. Add in your applicable educational background if the job description requires a Bachelor’s or Master’s degree. The example below uses strong language and markets the professional for the Dean of Students position. This is the opportunity to briefly display what you can offer the college or university with regards to their mission. The 2nd and 3rd paragraphs should be used to describe your relevant qualifications and highlight your accomplishments. Make sure they pertain to the desired position. This is where examples of how your skills, experience, or research directly correlate with what the employer is looking for. Over the last two years at State College, I have successfully increased donations by more than 80% bringing in over $1 million to the college”. Each of the middle paragraphs should describe why you are uniquely qualified for the position using keywords from the job posting itself. There are two options to fulfill this opportunity: bullet point and narrative. Bullet points are great if you want to catch the eye of the reader quickly and can concisely describe your accomplishments in about four bullet points. Using a narrative is another approach if you want the hiring committee to remember a story. Either option is acceptable; it simply depends on how you want to describe your experiences. Established a variety of innovative and successful academic programs to attract and retain students, reinforced educational offerings, and enhanced academic professional development. Spearheaded an academic growth program, enhanced curriculum development, and organized grant and funding initiatives. When thinking about writing your achievements in paragraph form, think of them using the CAR analogy: CHALLENGE-ACTION-RESULT. The final paragraph is where you thank the reader for their consideration and request the opportunity to meet in person. This is also the place for that final push, the last opportunity to tell the reader that you are the right candidate. “I will call in one week to follow up and find out if I can clarify any questions you may have” or “I will contact you within the next few days to set up a time to speak more specifically about how my skills will directly benefit your academic community”. If you decide to go with this closing, make sure you follow through with connecting with the institution. Consistency is key when submitting several documents with your application. It is important that your paperwork reflects the polished and professional personality that is submitting it. Ensure your cover letter matches the formatting you used for your resume. If you are sending thank you letters or recruiting/networking letters that they all have the same look. Simply copy and paste your heading, thus ensuring that the same font, size, and borders are present on everything. Double check to make sure all documents look the same before you submit. Proofreading may be something that seems obvious, but it is a step that should not be missed. If you have grammatical or spelling errors on your cover letter, it could automatically disqualify you from the position. It may also not pass the Applicant Tracking Systems. Your capacity to clearly communicate on your higher education cover letter will be a direct reflection of your ability. Whether you lead a department, teach a graduate class, or recruit and retain students. Read over your cover letter, print it off and read it again, set it aside and read it a third time. Always proofread and, when possible, have a friend do it for you as well. The cover letter is the opportunity to market yourself and your skills in a much less structured way in comparison to a resume. Make sure that your cover letter is engaging. Ensure it’s reflective of your skills specific to the position and allows your passion to shine through. An excellent letter will highlight the best parts of your resume without copying it word for word. The overall goal is to explain why you are the ideal person for the job. Why your experiences are relevant, and how you will use your well-tuned skills in this new role. 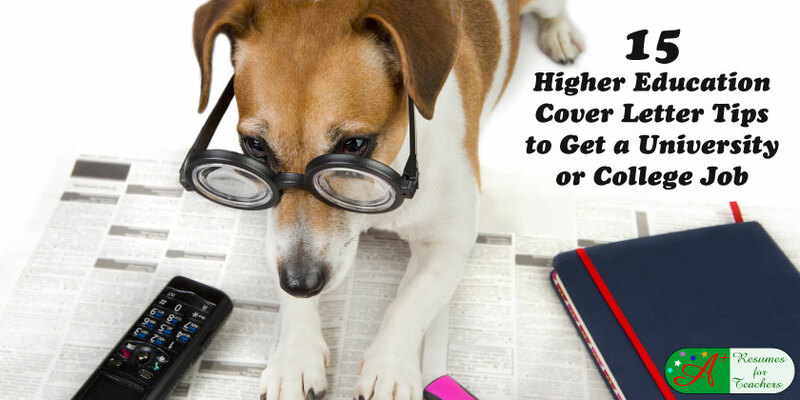 Take these higher education cover level tips to heart and you are sure to land that new job as the next Director of Academic Programs! If you need help writing your job search documents connect with me (Candace) via phone 1 877 738 8052 or send an email.